August 23 was Northeast Delta Dental Employee night with the Fisher Cats at the Northeast Delta Dental Stadium in Manchester, NH. Over 220 NEDD employees and their family members were included in the 5,887 fans that enjoyed picture perfect weather and a victorious game. Highlights of the evening included: the ceremonial first pitch thrown by Northeast Delta Dental employee Heidi Knight – which made it over the plate! 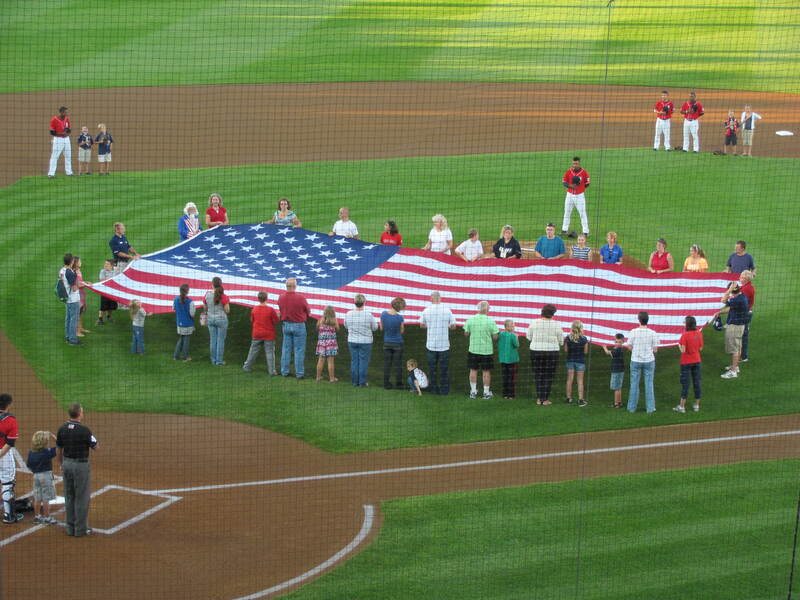 ; the giant American Flag presented on the field by 35 Northeast Delta Dental and Combined Services LLC employees and family members – it was an exciting moment when the flag was unfurled and the National Anthem played; and for between-innings entertainment, Karen Lucius and Peg Michaud played Build-A-Burger, but lost by one second to the “boys” team. Our own Patti Capone took this spectacular picture of the flag unfurling. What a great team we have at Northeast Delta Dental!